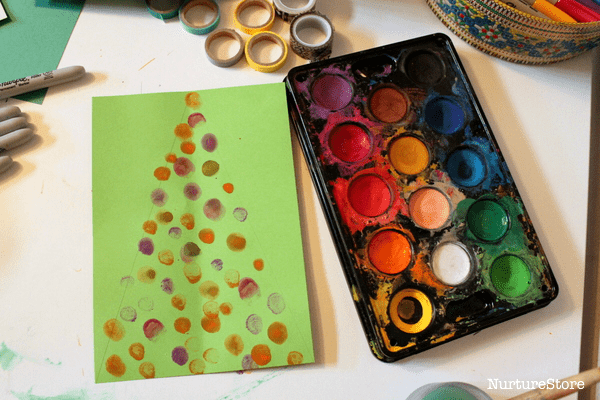 This gorgeous Christmas tree craft invites children to use their eyes to make a festive art display – or a Christmas tree matching game. 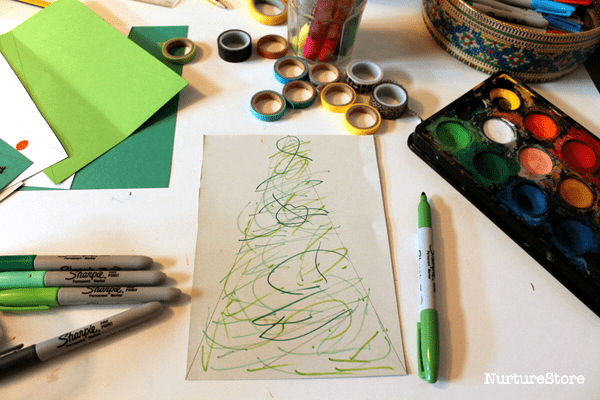 For our sense of sight activity we decided to make some Christmas trees, using our art materials to see if we could give every tree a design that looked completely different. This activity works well at home or school. 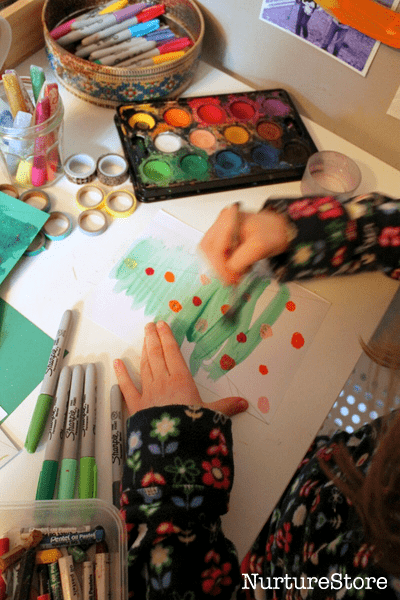 In a group, each child can contribute their unique tree design to a collective display. And at home, there is the opportunity to challenge yourself to think of as many different looks as you can. 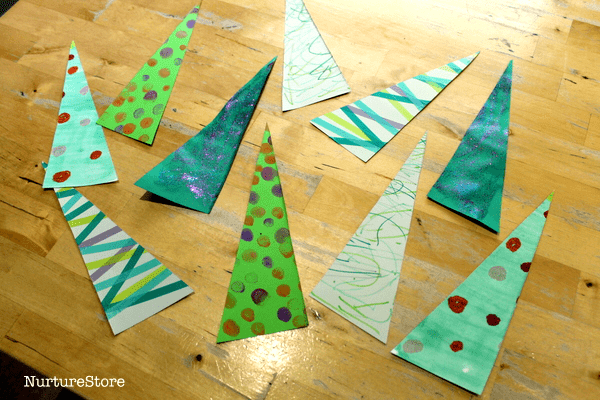 For each tree we started out with a simple triangle drawn on a piece of card. Then we used a different art technique on each tree to give them all a different look. 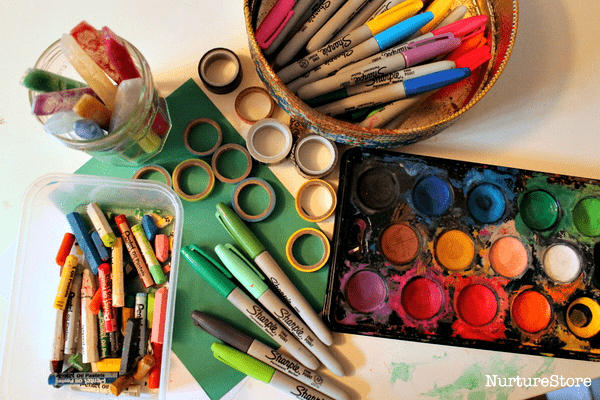 Anything goes here: invite your children to use their eyes to pick the colours, patterns, shapes and designs that they like. and a Christmas tree with little finger print decorations. 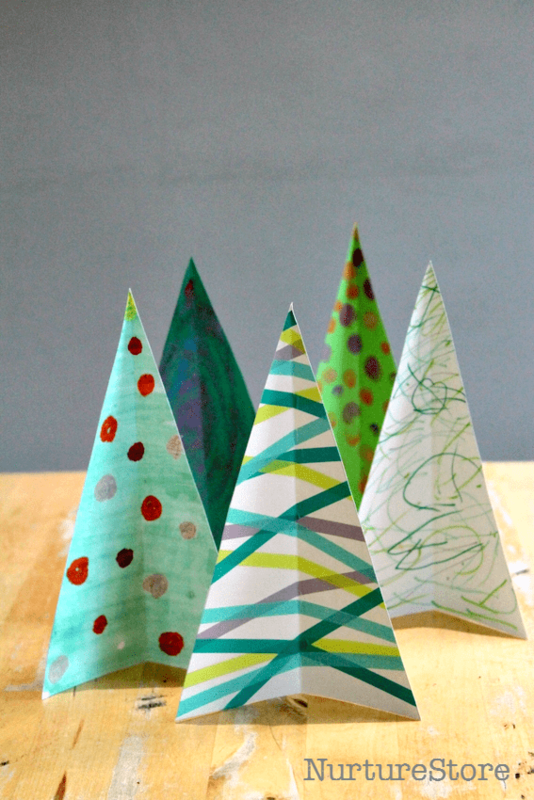 To create a gorgeous Christmas tree display you can simple fold each tree in half, so that it stands up by itself. I love how they look collected together, showing all the contrasts in design. 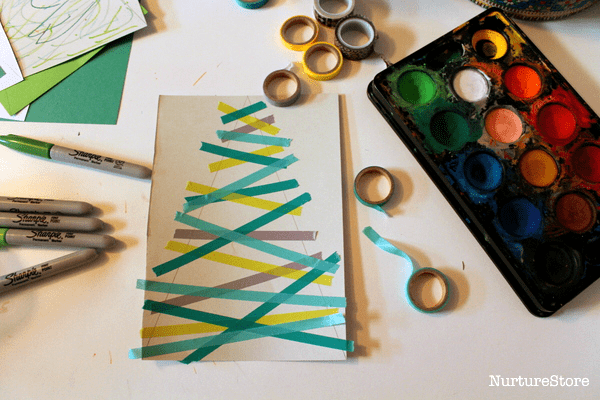 But, you can also use your art to make a Christmas tree matching game. Just cut each tree in half and lay all the pieces out, in a jumbled arrangement. Then see if you can find all the matching pairs. Matching games encourage children to look carefully and spot similarities and differences, skills they need for both math and reading and writing. Simple matching activities like this are great for toddlers and preschoolers. 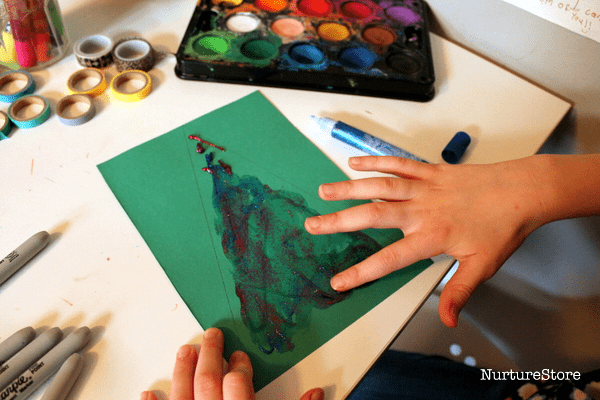 You could add magnets on to the back so you can make a matching forest of trees on your fridge door, or use them as a quiet time busy bag. This would make a lovely matching game Christmas gift a child could make for a younger sibling. A super fun and festive unit of learning! This kit gives you everything you need to teach an engaging program of activities all based around candy canes. With ideas for math, literacy, science, play, sensory, arts and crafts your children will love learning all through the holiday season. 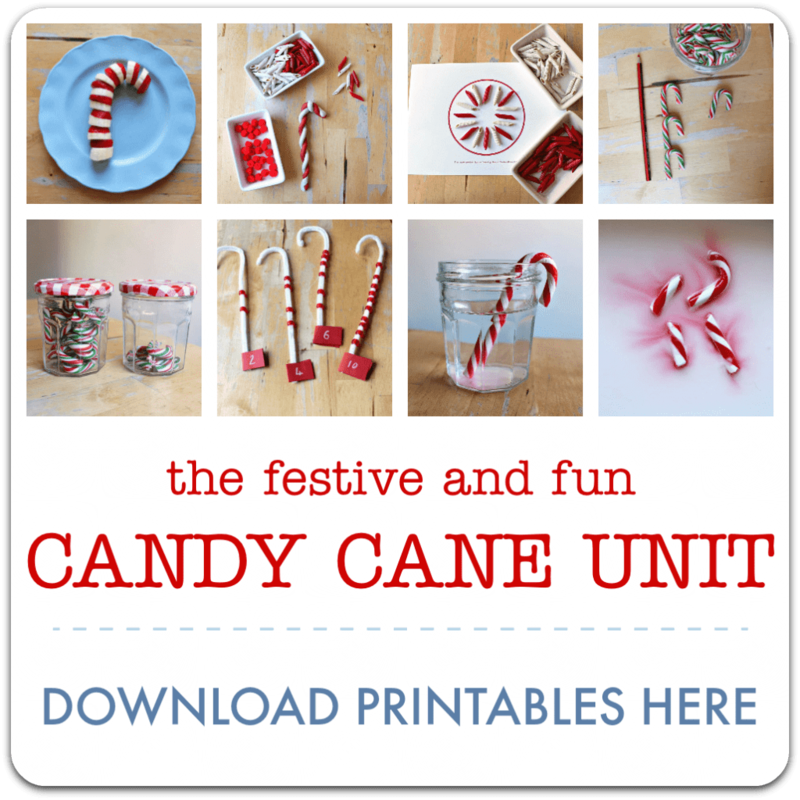 Click here to get your copy of the complete Candy Cane Unit. The trees came out lovely! They look beautiful arranged all together, b7r the game is a great idea as well! Thank you for the inspiration !! I enjoy using the ideas in your blog! !